National Instruments is a technology pioneer and leader in virtual instrumentation - a revolutionary concept that has changed the way engineers and scientists in industry, government, and academia approach measurement and automation. Showing recent results 1 - 15 of 647 products found. 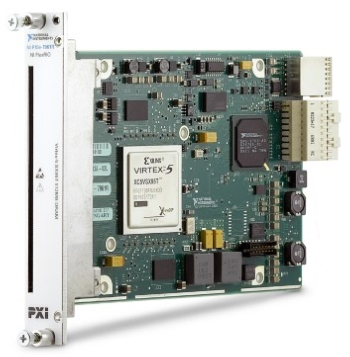 irtex-5 SX50T FPGA PXI FPGA Module for FlexRIO—The PXIe‑7961 provides flexible, customizable I/O for LabVIEW FPGA. It includes 132 single-ended I/O lines configurable as 66 differential pairs. You can pair the PXIe‑7961 with FlexRIO adapter modules that offer high-performance analog and digital I/O. Together, the two modules create a reconfigurable instrument that you can program with LabVIEW FPGA software. The PXIe‑7961 supports peer‑to‑peer streaming, which directly transfers data among multiple FPGA modules or select PXI Express modules without sending data to the host processor. With this feature, you can add FPGA capabilities to high-performance NI digitizers with NIST‑traceable calibration or expand your FPGA algorithms across multiple FPGAs for computationally demanding applications. PXI MultiComputing Remote Control Modules enable PXI systems to transfer data at multigigabytes per second with only a few microseconds of latency. You can use these models in applications such as real-time tests, hardware-in-the-loop (HIL) tests, and structural tests that need a large number of distributed PXI systems to share data with low latency. PXIe, 400 MHz, 1 GS/s, 14-Bit PXI Oscilloscope—The PXIe‑5164 high-speed oscilloscope has two channels that sample at up to 1 GS/s with flexible settings for coupling, voltage range, and filtering. PXI oscilloscopes also feature a number of triggering modes, deep onboard memory, and an instrument driver that includes data streaming and analysis functions. 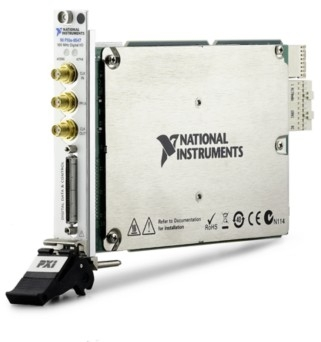 This device is ideal for applications with fast signals that require up to 400 MHz of analog bandwidth and flexible measurement configurations for up to 250 V. The PXIe‑5164 also features a user-programmable FPGA as well as PXI synchronization and data streaming capabilities. 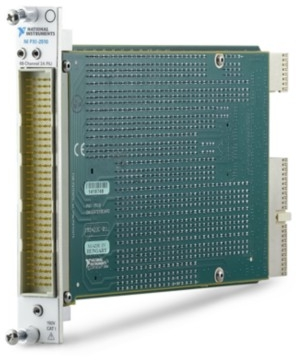 32 AI (18-Bit, 625 kS/s), 4 AO, 48 DIO, PXI Multifunction I/O Module—The PXI‑6289 offers analog I/O, correlated digital I/O, two 32‑bit counter/timers, and analog and digital triggering. The device delivers low-cost, reliable DAQ capabilities in a wide range of applications from simple applications in laboratory automation, research, design verification/test, and manufacturing test. You can add sensor and high-voltage measurement capability to your device with SCC or SCXI signal conditioning modules. The included NI‑DAQmx driver and configuration utility simplify configuration and measurements. 500 MHz, 50 Ω PXI RF Multiplexer Switch Module—The PXI‑2593 can be programmatically configured as unterminated multiplexers, externally terminated multiplexers, or dimensionally flexible sparse matrices. 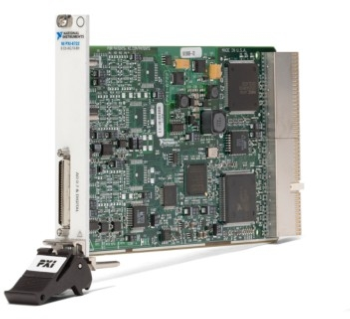 PXI Frame Grabber Modules work with any base-, medium, and full-configuration Camera Link cameras, and are ideal for many industrial, life science, and biomedical imaging applications. PXI Frame Grabber Modules support Power over Camera Link(PoCL) and can power cameras through PoCL-enabled cables. You can program the PXI Frame Grabber Module using the NIVision Development Module, or you can configure it using NIVision Builder for Automated Inspection(AI) software for faster development and simplified maintenance. 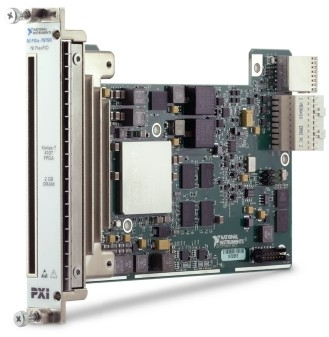 K410T FPGA, 1.7 GB/s, 2 GB DRAM PXI FPGA Module for FlexRIO—The PXIe‑7975 provides flexible, customizable I/O for LabVIEW FPGA. It includes 132 single-ended I/O lines configurable as 66 differential pairs. You can pair the PXIe‑7975 with FlexRIO adapter modules that offer high-performance analog and digital I/O. Together, the two modules create a reconfigurable instrument that you can program with LabVIEW FPGA software. The PXIe‑7975 supports peer‑to‑peer streaming, which directly transfers data among multiple FPGA modules or select PXI Express modules without sending data to the host processor. With this feature, you can add FPGA capabilities to high-performance NI digitizers with NIST‑traceable calibration or expand your FPGA algorithms across multiple FPGAs for computationally demanding applications. With DataFinder, you can index data from any file format regardless of source to perform more effective search queries and manage who has access to download, analyze, and create reports from data. 13-Bit, 8-Channel, 800 kS/s PXI Analog Output Module—The PXI‑6722 is a high-speed analog output device designed to deliver simultaneous, multichannel updates for control and waveform output applications, such as stimulus-response, power supply control, high-speed, deterministic control, and sensor/signal simulation. In addition, the device provides eight 5 V TTL/CMOS digital I/O lines; two 24‑bit, 20 MHz counter/timers; and digital triggering and external clocking capabilities. The PXI‑6722 can replace several kinds of instruments, including stand-alone proportional integral derivative (PID) controllers, low-speed arbitrary waveform generators, and function generators. You can control each data point for each channel to define common waveforms, such as square, sine, or sawtooth, as well as complex waveforms. 204.8 kS/s, 113 dB, 2 Gains, 0.5 Hz AC/DC-Coupled, 8-Input PXI Sound and Vibration Module—The PXIe‑4492 is designed for sound and vibration applications. With 24-bit analog inputs and IEPE constant current signal conditioning, the module is ideal for making precision measurements with microphones, accelerometers, and other transducers that have very large dynamic ranges. The PXIe‑4492 delivers simultaneous sample on all channels. In addition, it includes built-in antialiasing filters that automatically adjust to your sample rate, software-selectable input gains, and TEDS smart sensor support for error-free setup. Common applications include noise, vibration, and harshness (NVH) analysis; large microphone arrays; and dynamic structural test. 10 MHz to 6 GHz USRP Software Defined Radio Reconfigurable Device—The USRP-2944 provides an integrated hardware and software solution for rapidly prototyping high-performance wireless communication systems. 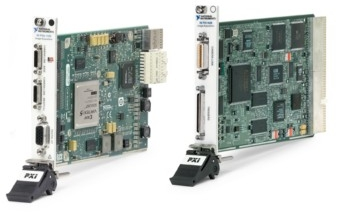 Built on the LabVIEW reconfigurable I/O (RIO) architecture, USRP RIO delivers an integrated hardware and software solution, so researchers can prototype faster and significantly shorten time to results. You can prototype a wide range of advanced research applications that include multiple input, multiple output (MIMO); synchronization of heterogeneous networks; LTE relaying; RF compressive sampling; spectrum sensing; cognitive radio; beamforming; and direction finding. PXIe, 100 MHz, 32-Channel PXI Express PXI Digital Waveform Instrument—The PXIe‑6547 is a digital waveform generator and analyzer for interfacing and basic characterization test with 32 single-ended digital pins. The device is capable of sampling digital waveforms at up to 100 MHz and interfacing with user-programmable voltage levels that have a 100 mV resolution. 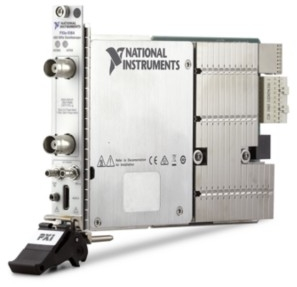 The PXI‑6547 also features advanced synchronization capabilities for building integrated mixed-signal test systems, hardware comparison for bit-error test, and per-bank digital timing features. The Switch Device for PCI Express provides two PCI Express upstream ports and eight downstream ports. You can connect the downstream ports to external devices, such as a Software Defined Radio Reconfigurable Device, to create large multichannel, multiple input, multiple output (MIMO) systems. 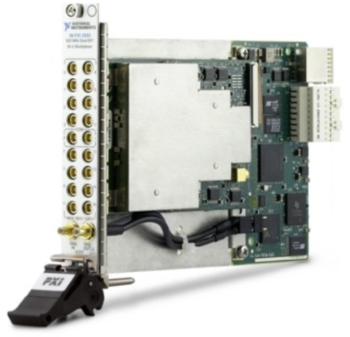 You can also connect multiple Switch Devices for PCIe to a single PXI Express chassis to create large MIMO systems with a Software Defined Radio Reconfigurable Device. PXIe, 200 MHz, 32-Channel PXI Digital Waveform Instrument—The PXIe‑6548 is a digital waveform generator and analyzer for interfacing and basic characterization test with 32 single-ended digital pins. The device is capable of sampling digital waveforms at up to 200 MHz and interfacing with user-programmable voltage levels that have a 100 mV resolution. 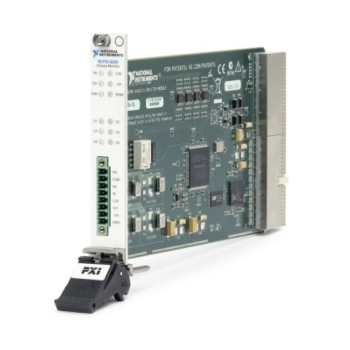 The PXI‑6548 also features advanced synchronization capabilities for building integrated mixed-signal test systems, hardware comparison for bit-error test, and per-bank digital timing features. 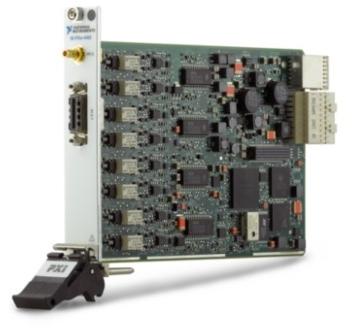 Virginia Panel Corporation (VPC) provides Mass InterConnect Solutions that enable simultaneous connection of multiple test and measurement signal types through one modular interface. Designed to accommodate signal, power, RF, thermocouple, pneumatic/vacuum, and fiber optic connector modules in multiple configurations, VPC’s innovative products meet the demands of test & measurement interconnect requirements.